More than 200 kms of new walking and cycling itineraries in Eastern Italy, around Verona. 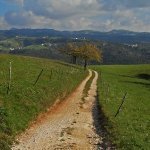 ItinerAria has been entrusted with the chore of studying the existing network of paths in the designated area and of tracing some walking and cycling itineraries, going through the analysis of the already existing signage and the criticalities of the routes. The goal is to realize a network of more than 200 kms of walking and cycling itineraries able to be covered safely by all the passionates, in order to discover the beauties of the Valpantena.